Gotham looks like a badass new series, but I have some heartbreaking news to share — on the show, the adorable Ben McKenzie has a fiancée. 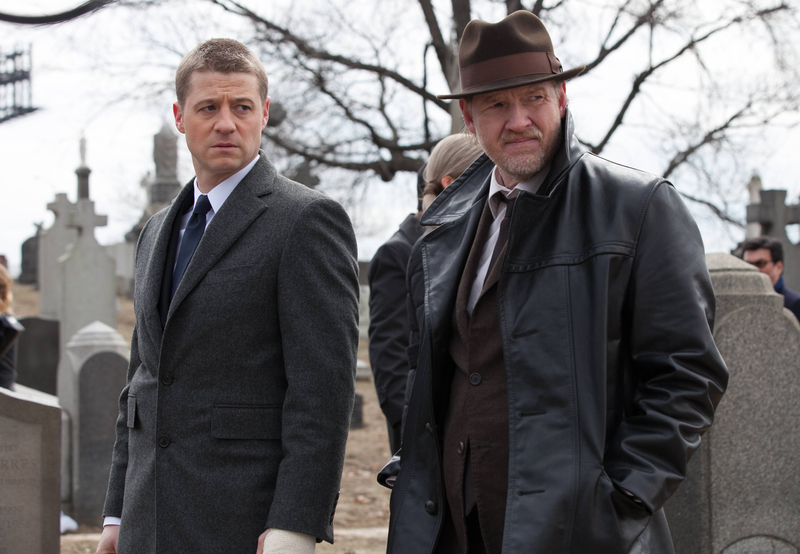 That's right, McKenzie fans, the actor plays Detective (not yet Commissioner) James "Jim" Gordon on Fox's Batman-based Gotham, and Gordon is engaged to the character Barbara Kean. But not surprisingly, there is trouble in Gotham City — not only with the tons of villains roaming the streets, but also in their relationship. McKenzie is no stranger to TV, as he portrayed Ryan Atwood on The O.C. and police officer Ben Sherman in the underrated Southland. The Welsh actress Erin Richards will be playing Barbara. Richards told Wales Online that her character has a "really dark past." Hopefully, Barbara won't ruin Jim Gordon's life like Marissa ruined Ryan's life on The O.C. Just because she has a history, doesn't mean that Barbara will be all bad, right? It would be hard to dislike Richards completely when her Twitter bio says she's a "strident feminist & lover of cheese based jokes." In The Legend Reborn preview special, McKenzie gave more insight into what to expect from the couple. He said, "James and Barbara have a natural, sort of emotional and sexual chemistry. Seemingly, everything is going very, very well ... But, Barbara is hiding things from James, including secrets about her past." Fiancée does not equal wife. So could Barbara and James breakup before they even get married? The Essential Batman Encyclopedia explains that there have been different iterations of Gordon's wife, but if the show follows the comics, they will get married. What happens after could vary between Gordon cheating on Barbara, Barbara dying, or her being the mother of Batgirl. The special also showed that Barbara has a relationship with another police officer — Renee Montoya. Montoya is part of the major crimes division of the Gotham police department. Introduced to the Batman comics in 1992 (after appearing in Batman: The Animated Series), Montoya is one of the few homosexual characters in the Batman world. Her inclusion in the show is bound to be good since she has a fascinating storyline from the comics — Two-Face (aka Harvey Dent) falls in love with her (which doesn't end so well), she has a relationship with Batwoman, and she becomes a superhero herself in the form of the Question. So, what does Montoya knows about Barbara's past? Could there have been a sexual relationship between them? There has been some speculation in the comments section of The Legend Reborn clip above. And in the special, it shows Montoya saying that Barbara deserves better than Gordon and then asking Barbara, "Does he know you like I know you?" The Movie Comics Whos Who blog claims the two women have dated, but there's no official evidence of that in the Fox show. So we'll have to wait and see if there is any truth in this theory. Since Montoya and Gordon have to fight crime together, it would make for an interesting workplace if Gordon doesn't know about his fiancée's previous romantic life. But a past relationship with a woman isn't "really dark." So Barbara must have a bigger secret she's hiding. I'm thinking that since her father is so wealthy, it may have something to do with her family's connections. All of the versions of Batman have shown that almost everybody is connected to a criminal in Gotham City. Barbara could be no different. I'd want Gordon's home life to be as drama-free as possible, however with the show being Gotham, I realize the chances of that are zero. But after fighting psychopaths on the streets, who needs to come home to lies from his future wife? Not the virtuous Jim Gordon, that's for sure.